Devastation. That is what southeast Saskatchewan and southwest Manitoba is experiencing right now. A torrential downpour that lasted nearly 4 days has finally ended, and now it is time to evaluate the damage. Shockingly large rain totals are coming out now, with some areas reporting between 7 and 9 inches of rainfall since Friday. Canada Day long weekend has turned out to be a rather dark and painful time. I’m not going to go through all the different areas affected, and show you pictures from all over the province. #skstorm will show you that on Twitter, and the news is alive with information, from speculation to hard facts. I will leave the news reporting to the news reporters and do as I have always done; tell you how it has affected my farm and my family. happen. However, optimism was still high for the area, since although many acres had been lost and crops were hurting, the right weather would really turn things around. Indeed, the right weather did show up for a few days, with surprisingly warm and sunny weather gracing the countryside and giving crops a desperately needed boost. Things were actually really starting to improve. My unease began to grow as Friday came around. The forecasts for the weekend, by a private and often accurate forecaster named World Weather, were becoming increasingly concerning. Overnight on Thursday into Friday, the town of Fillmore (about 12 miles from home) received almost an inch of rain. Throughout the day, little storms began to pop up, and before I knew it, our rain gauge at home had nearly 2 inches in it! What scared me was that the weekend had only just begun, and a rainfall warning was still in effect. On Saturday, we went most of the day without rain at home. But, by the evening, rain was falling pretty hard- and it wouldn’t stop. It rained hard all night and all day Sunday, even through most of Sunday night. Even yesterday it rained. We stand now at about 3 inches for the whole stretch at home, and over 5 at Fillmore. 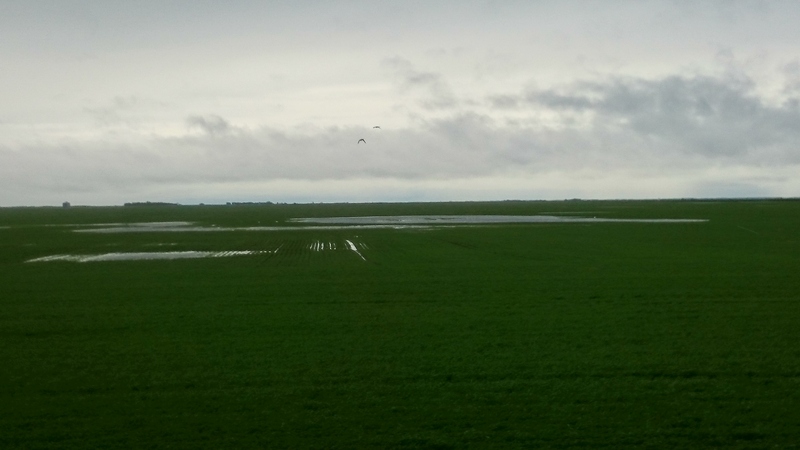 Crops are underwater in every low spot in every field, pea and lentil fields are yellow, and everything is just saturated to the point of flooding. Thankfully, we didn’t get the awful rain totals that other communities did. Weird to say that we are lucky to “only” get 3 inches of rain at home! My wife and I were on holidays in Kenosee for the weekend (a little lake further into southeast Saskatchewan than our home- about one hour away) where the rain was just as severe, if not worse, but we weren’t home for the storm. It was difficult to control my emotions during the holiday, knowing what was going on at home and all over southeast SK and southwest Manitoba. A devastating and catastrophic event was going on that was going to change many lives and cost millions and millions of dollars in damage. A mix of emotions ran through me throughout Saturday night and into Sunday… not only was I concerned about our crops, but I was also profoundly saddened by what was happening to what is my home country. My friends and family were right in the middle of the worst of the storm. My wife’s mother and father farm near Redvers, one of the hardest hit towns of all. My father-in-law could hardly get out of his yard for the flooding. Highways were washed out, fields were lakes, and basements were flooding. What I feel for the whole situation is something I cannot put into words. It is, quite simply, horrible for everyone affected. 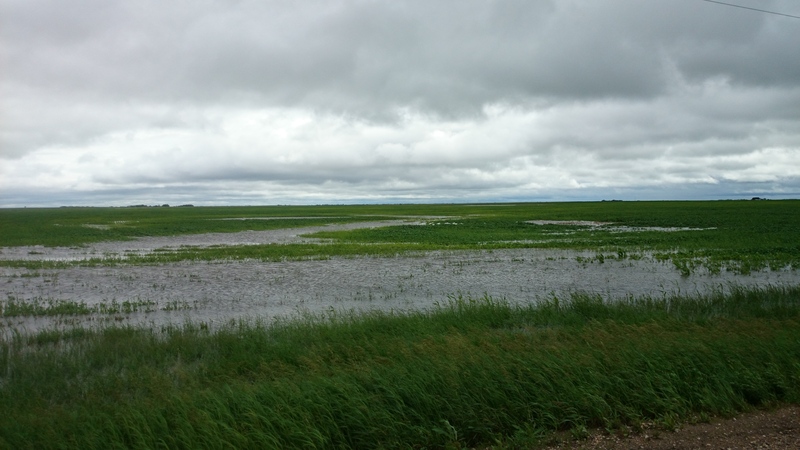 For the second time in four years, Saskatchewan and Manitoba are heavily damaged by floods. I start to ask myself, how do we farm in this climate? After all we did to work so hard to try and seed our crop in a timely fashion, to use the best practices we can to give our crops the best chance they can get, and despite all the hours of analysis we did on crops and fertilizers and chemicals, we still get burned. Still we must wonder how we are going to pay all the bills. Still we have to pick up the pieces and try again next year, and trust once again that if we do everything right, maybe we can move our family business forward. The last 5 years of farming have been difficult, and this storm is discouraging, to say the least. Despite all of this, I do consider us lucky. Our worst hit fields are well-drained parcels that should clear off fairly quickly. West of home, the rain was significantly less, so our western land will be fine. Our winter wheat at home is advanced enough to handle it, as is our earliest canola and wheat. 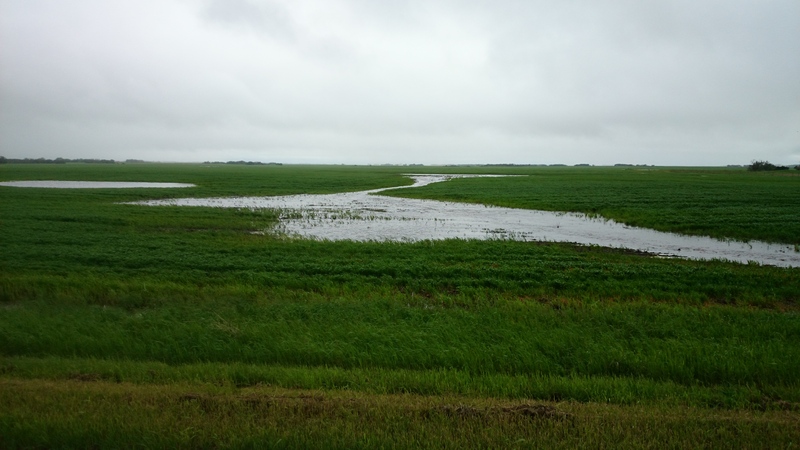 We did not get the torrential rainfall that areas further east did, and because of that, our land isn’t a lake, and our roads haven’t washed out. Sometimes, when the worst-case scenario gets thrown at you, you just need to look at it and realize that somebody, somewhere, is harder-hit than you are. Although, if we had gotten nine inches of rain here, as many others did… my attitude would probably be much worse. Nevertheless, there is no doubt that this event will cost us money. If we can get a breakeven crop this year, I will be happy. The odds of this being a profitable crop now are not very good. The tipping point has now been reached for much of our crop; the excess moisture has now reached a point where many crops will not recover. Our flat land drains slowly, and it will be some time before we can get into our lower land again. Finally, however, there is light at the end of the tunnel. A forecast I have been dreaming about for two months is finally in front of us, with warm, sunny weather filling every day of the next week. If this finally occurs, crops should recover relatively well. Certainly, much has been lost that will not recover, no matter the weather, but what is still there may just turn out alright. We will need all the heat units we can get… crops have a long, long way to go before the inevitable fall frost comes. When will it be? Time will tell. Good luck to everyone out there affected by this weather event. I know that we are lucky here, considering how bad it has been for many other areas. For anyone reading this in the most affected zones, how bad do you think the damage will be? Will your crops recover? Drop in a comment and let me know.